This day is a wonderful way to share the light of Christ with so many in our Community! The Planning Team will continue to gather sites to visit and volunteers to help - up through the beginning of October. Site Leaders -- if you said yes on your volunteer registration, you are considered specially awesome! What's next for you? Site Bag Pick Up - October 20 and 21. Each site leader will receive a bag which includes the information on your assigned site, and a listing of volunteers to be contacted with details of the day. Bag pick up will be in the Community Room of the church after all Masses that weekend. Note - we strongly encourage a short visit to the site before our day of service to familiarize yourself with the project and avoid any unexpected surprises. Contact the Site and your volunteers within 6 days of bag pick up - All contact information is included in your bag. Site Leader Roundtable - November 6th 6:30 in the Community Room. Please come to this evening to give valuable feedback and hear other site leader stories which helps us so much in our planning. General Volunteers - Your Site Leader will contact you via phone or email between 10/21 and 10/26 to let you know details of your service project. 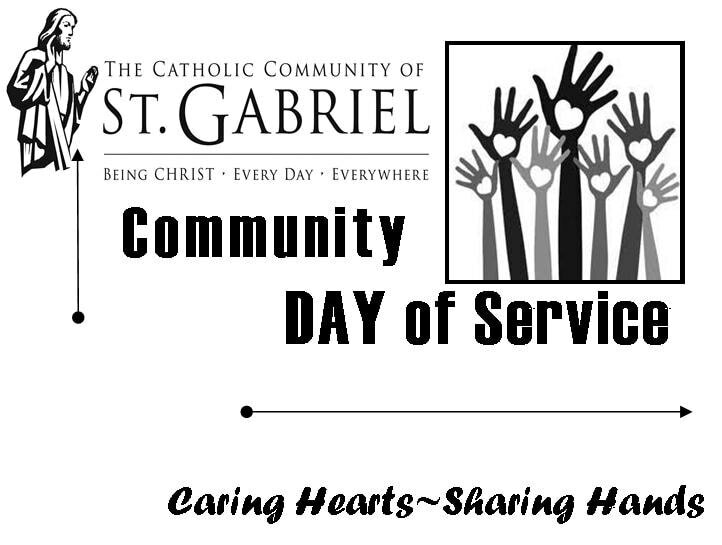 If you have not heard from anyone by October 28, please call the parish office. Questions? We are here to help anytime. Just email HERE. Your Planning Committee thanks you for participating in this great day!